When a family gets growing, like a newborn baby coming, people usually need to get a new house with more rooms. A business is the same. Thanks to the clients’ support during the past few years, our business has been developing to a new stage. The old place is nice, but felt smaller and smaller. More room is needed. We moved to a new place with double size of storage. It took the last whole mother. We moved everything, tons of stocks, to the new warehouse. At the same time we have to operate the business as usual, check emails, make phone calls, schedule staff, and check inventories… we squeezed as much time as possible to do the major task of the month – moving. We hired a truck, a forklift, and I asked another two guys who usually just do the job on site to be back in warehouse and help us. So the truck and two forklifts can work together. Upload, shipping, download; upload, shipping download… one by one, very efficient. 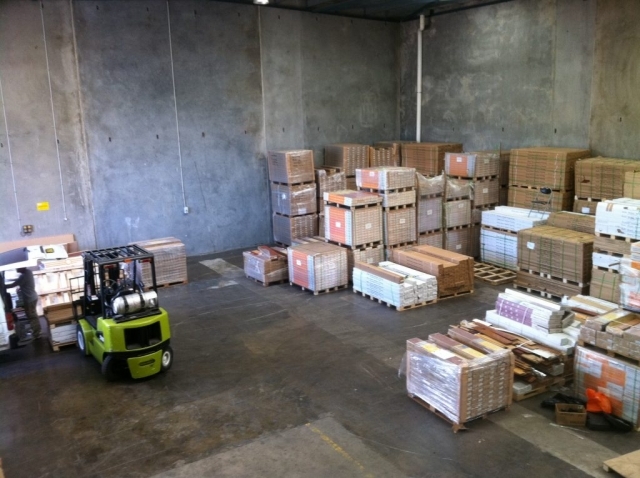 Here are two pictures of the new warehouse. Just warehouse. The office and showroom are still in a big mess, of course. How to buy bamboo flooring? Compared to traditional wooden flooring, we know now, bamboo flooring is used more and more due to its Eco friendly and wood-appearance features. We use bamboo products in our houses, we are protecting our forest, get the wood-like surface and save some money. We know bamboo flooring is good. 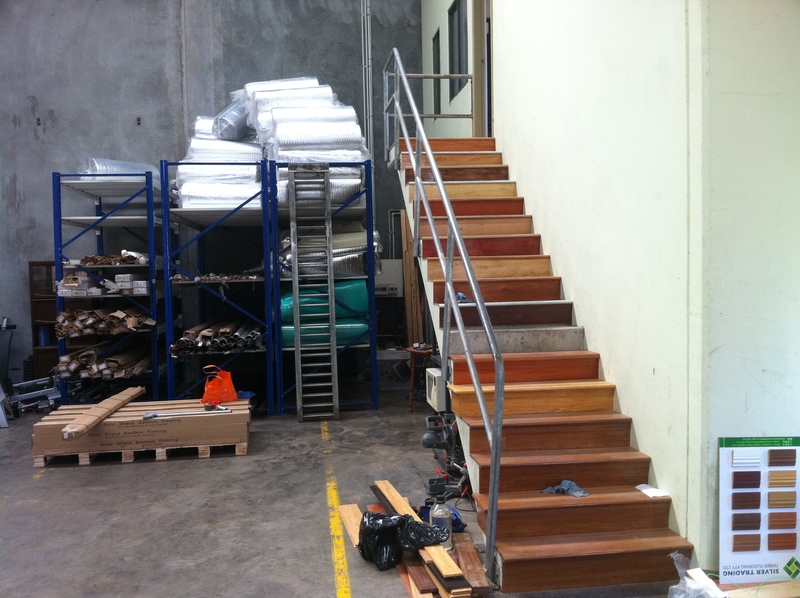 The problem now is how can we choose the bamboo floor correctly to fit our flooring needs. First question we have to ask ourselves is what is the sub floor we currently have, wooden or concrete slab. If it is wooden or particle boards sub floor, you can use any types of bamboo floor you like. If it is concrete slab, you’d better choose bamboo strand woven click lock floating floor. Because if you want to use Tongue & Groove type floor, which need to be nailed down by secret nails, you have to spend extra money laying a wooden sub floor or batten first before you install the bamboo T & G floor. Personally, I like to use the bamboo strand woven floating floor, no matter whether the sub floor is wooden or concrete. Strand woven bamboo is the hardest bamboo, even harder than most hardwood floor. Because it is floating, no matter what problem happens in the future, it is easy to fix and replace. And most important of all, it costs much less than traditional hardwood floor. How to know the moisture content of the sub floor. Before we lay the timber or floating floor, we need to know if the moisture content of the sub floor is suitable for flooring. There are basically three methods: Preliminary test, Electrical resistance test and Hygrometer test. Both Electrical resistance test and Hygrometer test need expensive equipment to do the tests. Here we’d like to introduce the preliminary test,which is the easiest way. Anyone can do it. A piece of impervious material such as polyethylene or vinyl sheeting (at least 600×600 mm). It is placed on the surface of the concrete slab to be tested and sealed through around all edges with moisture free sealing compounds. After a period of not less than 24 hours, the covered portion of the concrete slab is inspected for dampness. If this area is even slightly darker in colour than the remainder of the slab, the sub floor shall be considered too wet. Otherwise, it is dry sufficiently to lay floor on. How to choose the right underlay for floating floor? Floating floors are getting more and more popular due to their easy installation and pleasing quality. Every time before we lay the floating floors, we need to lay underlay first to provide insulation against sound and moisture. How can we tell the quality of underlays? Of course usually, the more expensive, the better. But we just want to choose the right one to meet our flooring condition without wasting money. If you are living in a house or ground floor of an apartment building, you can use any underlay you like. Just choose one from the list of our website. If you are a unit with someone else living under, you have to choose the underlay which at least has an acoustic test certificate from third parties, which will avoid you from big trouble in the future. Choosing the right underlay is simple, but important. If you have any questions, please don’t hesitate to contact us for more information. When we choose the timber for flooring, the first thing we have to ask is whether the one we are going to use is of good quality. Usually we use the Janka rating as a measure of the wood’s hardness. The higher the number, the harder the wood. Below is the list of the Janka rating for various woods. Bamboo floor, timber floor and laminate floor are relatively easy to take care of compared to carpets. But they still need routine maintenance. Keep the floor away from water. If the area is flooded because of water pipe leaking, the floor will definitely get damaged. If you drop a glass of water, wipe off with towel as soon as possible. Leave grit, especially sand outside when you walk inside. The grit will gradually grinds into the floor and abrades the finish. Use a vacuum cleaning frequently to clean the floor with a soft floor brush. Put a door mat at every external door way. If you can use your floor carefully and keep it clean, the floor usually lasts much longer. Usually our products are just AC3, because the course surface texture of AC4 and AC5 is too rough for bare feet, which will make users very uncomfortable. 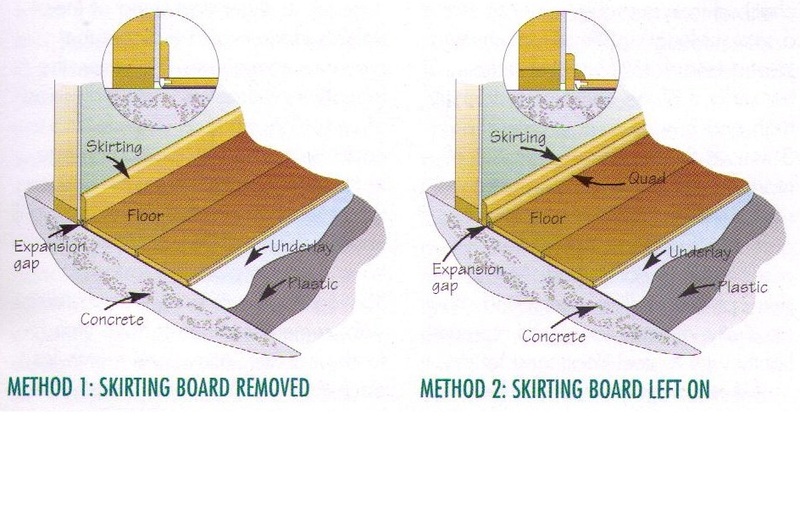 There are basically two methods to deal with the existing skirting when we lay the floor. Method 1: Remove skirtings and install the new/old skirting back after laying the floor. Method 2: Leave skirtings in place and cover the expansion gap by nailing a bead of quad to the skirting. Method 2 is the easier way. When using method 1, we have remove the skirtings first, which are usually fixed to the wall by nails or glue. Some minor damages may be caused to skirtings and wall. Some touch-up paints have to be done after installation. Before flooring, we need to check the surface of the subfloor if it is suitable for flooring on directly. Plainness. When a straightedge 1.5 m long is placed on the surface at any position, no part of the surface shall be more than 6 mm below the straightedge. Smoothness. When a straightedge 150 mm long is placed on the surface at any position, no part of the surface shall be more than 1 mm below the straightedge. It’s an easy way to do before starting flooring.